On June 6, Maryland Attorney General Brian Frosh joined six attorney generals in challenging the Environmental Protection Agency’s (EPA) failure to label chlorpyrifos as unsafe for humans in any quantity. Six weeks later, U.S. Senator Ben Cardin announced his co-sponsorship of a bill that bans chlorpyrifos. What exactly is chlorpyrifos and why is everyone so up in arms? Here’s the scoop. Chlorpyrifos is an insecticide that is widely used in agriculture throughout the United States, including in Maryland. In 2000, the EPA severely restricted home use of the chemical after it was discovered that developmental delays such as hyperactivity and motor control issues, attention deficit disorders, and decreased IQ scores resulted from even low levels of exposure. This comes as no surprise, as the insecticide belongs to a class of chemicals called organophosphates, which includes now outlawed chemicals like sarin gas that were used in WWI as neurotoxins to halt transmissions in a soldier’s brain. While chlorpyrifos is most harmful to developing humans, people of all ages can suffer from nausea, dizziness, convulsions, and death from acute exposure. Evidence of these harmful effects were witnessed in Hawai’i last year, when ten workers were hospitalized from exposure. 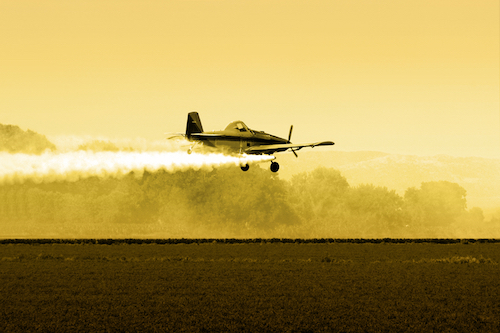 Despite paramount evidence of detrimental effects on animals and people, agricultural use of chlorpyrifos is still commonly practiced, and 5 million pounds of chlorpyrifos are sold domestically every year. Earthjustice reportsthat chlorpyrifos is used on common crops that families consume daily, such as wheat, corn, citrus fruits, strawberries, and more. In fact, more than half of apples and broccoli grown domestically are sprayed with chlorpyrifos, and the USDA’s Pesticide Data Program found the chemical’s residues on produce even after being washed and peeled. It is also the pesticide used most readily on corn and soybeans, and over a million pounds are applied annually to each crop. A 2012 study at the University of California at Berkeley revealed that the chemical’s widespread agricultural use has even caused it to leach into our water sources, and reported that 87 percent of umbilical-cord blood samples from newborn babies studied contained detectable levels of chlorpyrifos. Clearly, even if you do not live near a field using chlorpyrifos or eat contaminated food, you are at risk for ingesting the chemical. Environmental and public health groups have been seeking a ban of this chemical since 2007, when the Pesticide Action Network and Natural Resources Defense Council filed a petition to force the EPA to address concerns over unsafe levels in drinking water. In November 2016, EPA scientists reported that residues of chlorpyrifos on food crops exceed the federal safety standards for pesticides and that there are no safe uses for the pesticide. The ban bill, introduced by Senator Tom Udall of New Mexico and called The Protect Children, Farmers & Farmworkers from Nerve Agent Pesticides Act, will prohibit all chlorpyrifos use in food. It will also require the EPA to collaborate with the National Research Council to assess the health effects of pesticides with similar chemical structures on agricultural workers and children. Finally, it will require public education concerning the history of chlorpyrifos and the communities that are most affected by it. Marylanders should be proud of Sen. Cardin and Attorney General Frosh for their efforts to protect public and environmental health. Unfortunately, the fight to ban chlorpyrifos is far from over. Will you please thank Attorney General Frosh and Senator Cardin for their leadership in protecting our health? We’re proud to see our Maryland leaders working to create a healthier food system and are sure you agree. Let’s recognize their efforts!